The PR Lawyer: Where were you when the lights went out in New York City? Where were you when the lights went out in New York City? “Where were you when the lights went out in New York City?” These are the lyrics to a song made popular by Philly’s own, The Trammps, back in 1977.The song “"The Night the Lights Went Out" likely makes no sense to most Gen-Y’ers today. And yet, my poor husband and kids have heard me tell the story many times as we’ve driven through the Lincoln Tunnel – 30 years ago today. I was reminded this morning when reading the New York Times that on July 13, 1977, a 25-hour blackout hit the New York City area after lightning struck upstate power lines. I remember it like it was yesterday. . . my mother’s worry while the lights disappeared in the tunnel. . . my father’s protective nature and determination to “get us out of this mess.” And then pulling into “The City” to find that the only lights were those of the cars trying to maneuver amidst the chaos. We slept in our Chrysler Cordoba that night which was parked just outside Central Park. 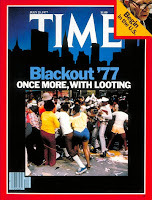 I remember looters banging on the car windows, a lot of noise and mayhem. My father promised to keep us safe and kept telling me to go to sleep, that he wouldn’t let anything happen to us. He was right. So today, I reread the New York Times article: Power Failure Blacks Out New York; Thousands Trapped In The Subways; Looters And Vandals Hit Some Areas. What memories it brings back. And just think, who would have thought back in 1977 that we’d be able to re-read the headlines 30 years later without entering a hot and dusty attic or accessing the library’s microfiche? Tell me, where were you when the lights went out?